The first talk of the day was the Laboratory Astrophysics Division plenary given by Dr. David Neufeld (Johns Hopkins University). While biologists and chemists can poke and prod some of the substances they study, astrophysicists aren’t so lucky. Other than rocks from the Moon and a puff of cometary dust captured in aerogel, we get most of our information about the universe from photons and gravitational waves (other than solar system missions, through which we can directly probe magnetic fields and plasma — but we don’t get to bring those home with us!). Laboratory astrophysics is a powerful tool to help us interpret the messages those photons are sending, giving us a better idea of the physics at work in the universe. Dr. Neufeld specializes in laboratory studies of small molecules, the kind that might be found in the interstellar medium or the material surrounding young stars. In particular, Dr. Neufeld studies a class of small molecules called hydrides — molecules made up of just one heavy element (typically one that is happy to donate electrons) and any number of hydrogen atoms. So, for example, ammonia is a hydride since it contains only one “heavy” element (nitrogen). Take hydrogen fluoride (HF) as an example. Laboratory studies showed that HF should form readily in cold environments from molecular hydrogen and fluorine, so even though fluorine isn’t extremely abundant in the universe, it should form HF whenever it’s in a cold environment with abundant molecular hydrogen — like the interstellar medium. Observations of diffuse interstellar clouds showed that HF was present — and could be used to trace more diffuse clouds than carbon monoxide could. Just one example of how laboratory astrophysics can guide observational astrophysics! Warm interstellar gas can also be traced by hydrides, in this case SH, SH+, and CH+. These molecules react endothermically with H2, and the amount of heat needed for the reaction differs between the three molecules. Determining the amount of each of the three compounds in an interstellar cloud can help us figure out the temperature of the cloud. Cosmic rays, which aren’t “rays” at all but instead extremely relativistic particles, ionize gas everywhere from Earth’s atmosphere to the most distant interstellar clouds. 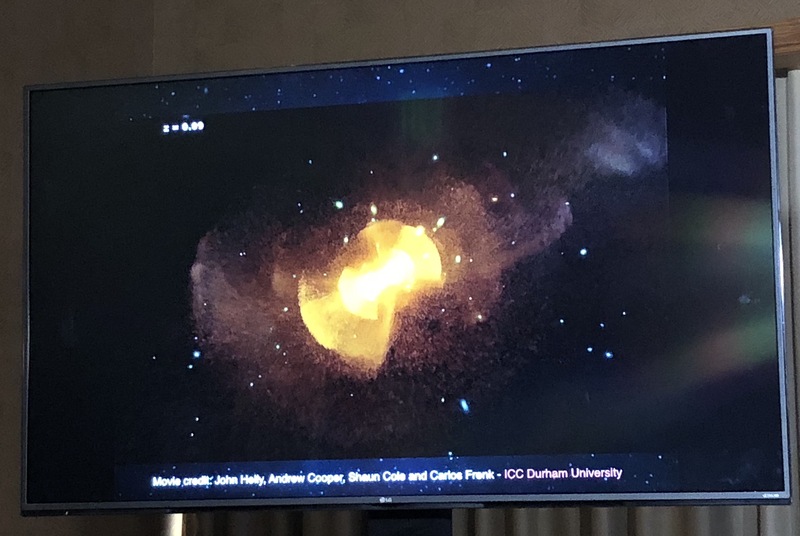 Dr. Neufeld highlighted two ways in which interstellar molecules can be used to measure cosmic ray ionization rates: observing H3+ ions in diffuse molecular gas and observing ArH+ in diffuse atomic gas. In order to use molecules to infer the properties of interstellar gas, we need to know how those molecules behave under different conditions (temperature, density, etc.). That’s where laboratory astrophysics is hugely helpful! In the future, expect to see astronomers pair more laboratory determinations of molecular properties with observations to learn more about the interstellar medium. 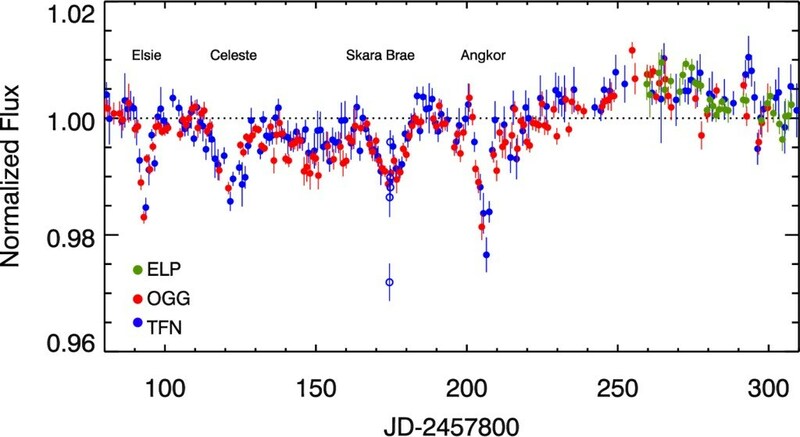 What’s the latest news regarding the mysterious Boyajian’s star? This strange object and another odd star, Epsilon Aurigae, were the subject of the talks at today’s morning press conference. The first presentation was given by two high school students, Yao Yin and Alejandro Wilcox of the Thacher School! These intrepid students presented their research monitoring Boyajian’s star since April of 2017 using the Thatcher Observatory. Yin and Wilcox found that Boyajian’s star’s bizarre flux dips have a dependence on the wavelength of light observed, suggesting that the dimming may be due to dust that differs in composition or size distribution. Eva Bodman, a postdoc at Arizona State University, backed these findings with the results from a Kickstarter-backed study of Boyajian’s star using LCOGT. An endearing quality of this campaign is that funders get to vote on the names of the weird dips in Boyajian’s star’s light curves! Bodman’s work focused on four dips in particular: Elsie, Celeste, Skara Brae, and Angkor. This study agrees that dust is the most likely conclusion for the dips — and it appears to be an extremely complex dust cloud that is likely clumpy and amorphous, with ephemeral fine grains and longer-lasting large grains. 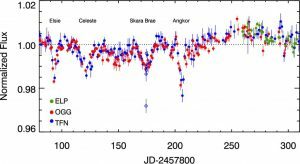 We still have a lot to learn about this strange star! Bodman @ehlbodman tells us that the dust from Tabby's star is complex, more like a misty cloud than the dust in our home. My home has no dust. Switching up the topic, Dr. Robert Stencel from the University of Denver presented work completed with his graduate student Justus Gibson on Epsilon Aurigae, which belongs to a class of ‘disk-eclipsed’ binary stars. This is a very bright star, often associated with a hidden companion that is grabbing material and creating an accretion disk that produces irregular variability in its flux. When given the opportunity to interferometrically image the disk, observers found an opaque accretion disk, with the data characterizing the star as a pre-asymptotic giant branch star that may be obstructed by this disk. A question raised during the Q&A led to interesting discussions — what can comparing these two stars tell us? The participants felt that any oddities in stellar observations can help provide us with more insight in the science of stars, pushing the limit of what is possible with the observations of stellar-type objects. The “Local Group” refers to the Milky Way, M31 (the Andromeda Galaxy), and about 50 nearby dwarf satellites. By studying the kinematics of these satellites, we can better understand all kinds of science. The recent data release from the European Space Agency’s Gaia mission has revolutionized our ability to do this by measuring the proper motions of over a billion stars to incredible precision — the accuracy involved in these measurements is equivalent to measuring the speed of human hair growth at the distance of the moon! The orbits of Milky Way satellites: Besla started by noting the historical importance of the Magellanic Clouds to indigenous cultures around the world (see the figure below). The new Gaia data can tell us about how these galaxies, which are the Milky Way’s nearest satellites, orbit the Milky Way. It suggests that these satellites are “new neighbors” that only recently fell into the Milky Way’s gravitational potential for the first time! The Large Magellanic Cloud (LMC): The LMC seems to be moving much faster and is about 10 times more massive than was previously thought. In fact, the LMC is so massive that it dragged five other satellite galaxies along with it when it fell into the Milky Way. It’s even massive enough to perturb the Milky Way’s halo and change its shape! Andromeda and its satellites: In 2012, the Hubble Space Telescope delivered a (very) early collision warning: in a few billion years, the Andromeda galaxy (M31) will irrevocably change our view of the night sky. It’ll collide with our Milky Way, destroying the galactic disk and leaving us sitting in a giant elliptical galaxy (see the figure below). Now, with Gaia DR2, we can look directly at internal motions of M31 and its largest satellite M33! We can confirm the earlier result that Andromeda will in fact collide with our galaxy — but beyond that, we can watch how M31 and M33 are rotating and interacting with each other. Besla’s group has found that, like the LMC in our Milky Way, M33 may be on its first infall into Andromeda now! The James Webb Space Telescope will look more at M31’s satellites in the future. Astrobiter Gourav Khullar presented today in the “College-Level Astronomy Education: Research and Resources” session. 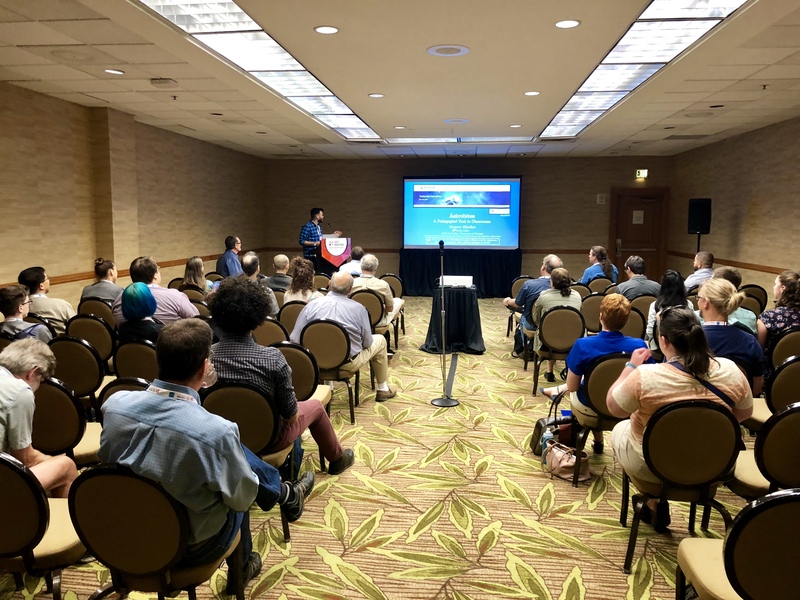 At two past AAS meetings (AAS229 and AAS231), Astrobites hosted workshops on how to introduce modern research into undergraduate and graduate classrooms using astrobites.com as a resource. Today, Khullar provided a speed-introduction to the idea for educators and outreach practitioners who may not yet have considered the idea, or who may not know where to start! Gourav Khullar presents on using Astrobites to bring current astronomy research into the classroom. Khullar opened his talk with a brief overview of the site. Astrobites recently celebrated publishing its 2,000th article (! ), so the site, at this point, provides an extensive archive of brief summaries of astronomy research conducted over the past 7 years. Have a topic in mind that you’d like your students to learn about? We’ve almost certainly covered it! Khullar then briefly introduced the three full lesson plans that we’ve written up as suggestions of how to use Astrobites in the classroom — which come complete with student handouts, online form templates for collecting student work, grading rubrics, adaptations for different learning levels, and more. He rounded out the talk by introducing the research study we are currently conducting — with the aid of an AAS Education & Professional Development (EPD) mini-grant — to explore how Astrobites has been used in classes and the impacts that it has had. If you’ve used Astrobites in your class or journal club or plan to in the future, and you’d be interested in being a part of our study, please don’t hesitate to reach out! Email us at astrobites@gmail.com. Kris Youakim from the Leibniz Institute for Astrophysics in Germany then continued on this theme. He started with some beautiful simulation videos of dwarf galaxies being accreted onto the Milky Way, and then showed that we can actually use stars with very low metal abundances to trace this accretion. In particular, he found that the most metal-poor stars are the most strongly clustered. This implies that not only are there a lot of small metal-poor dwarf galaxies, but also that these satellites haven’t yet been tidally disrupted by the Milky Way. Aparna Venkatesan (University of San Francisco) next discussed how we might be able to use nearby galaxies as a tool to answer questions about much more distant objects, such as the very first stars in the universe. She argues that nearby low-mass, star-forming galaxies are ideal analogs for the first galaxies that formed in the universe. Studying these convenient nearby dwarfs can therefore advance our understanding of early star clusters and the physical conditions of early galaxies, providing context for when we start to get results from JWST’s planned observations of distant galaxies in the universe. It’s a great time to be an astronomer! In the final plenary session of the day, Dr. Keivan Stassun (Vanderbilt University) highlighted the many (many!) exciting advances in the field of high-precision astrophysics. In this talk, Dr. Stassun focused on the importance of precisely determining the properties of stars. After all, you need to first understand stars in order to understand the planets that orbit them, the galaxies that are composed of them, and how those galaxies have evolved over time. Dr. Stassun focused on three categories of advances in high-precision astrophysics: astrometry, photometry, and spectroscopy. He covered a lot of cool techniques, but here I’ll summarize just a few. Astrometry is one of the oldest astronomical techniques, but this simple act of plotting the positions of stars and tracing their motions is still valid today. 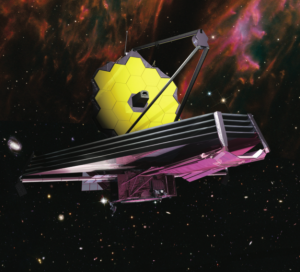 Highly precise parallaxes (the kind you might get from Gaia or Hubble) enable a technique that Dr. Stassun calls “pseudo-interferometry,” which allow us to make careful measurements of stellar radii. Advances in astrometry may soon allow us to determine stellar radii to within a few percent at a distance of three hundred light-years! Precisely measuring the radii of stars is critical for studying exoplanets (since uncertainty in the radius of the star translates to uncertainty in the radius of the planet… and its density, composition, surface gravity…) and can also help us better understand stellar activity and stellar structure. One of the coolest techniques that Dr. Stassun covered in his talk was the use of highly precise photometry (measuring the light from an object in wide wavelength ranges) to obtain stellar masses. This technique works by analyzing the change in the light emitted by the star due to granulation — the motion of individual convective cells bubbling up to the surface of the star. The amplitude of the modulation tells us about the surface gravity of the star. If you know the radius of the star (say, from some precise astrometry), this gives you the mass. The most exciting part of this technique is that it works for individual isolated stars, which have long been a challenge to weigh! Dr. Stassun estimated that this technique will yield masses to within 10% accuracy for hundreds of thousands of stars. While highly precise spectroscopy is exciting in and of itself, it’s best when paired with machine learning. Using machine learning, we can amass thousands of stellar spectra and extract temperatures, gravities, bulk metallicities, and abundances of individual chemical elements for the individual stars. This means large-scale chemical forensics, allowing us to piece together the formation histories of everything from galaxies to planetary systems and track down the Sun’s long-lost siblings! While astronomers have already achieved amazing advances with the help of precise astrophysical techniques, more discoveries are headed our way. So sit back, relax, and enjoy the show (or get some data and get crunching! ).